How To Farrier Your Own Horse, And Should You? A horse should have a complete examination and trim by a professional farrier once every two months. This can be costly, and many horse owners are tempted to do their own farrier work. While it is certainly advisable to provide your horse with regular maintenance by picking up, handling and cleaning his feet daily and trimming off and rasping rough spots as needed, actually being your own farrier is not advisable unless you have been properly trained as a farrier. You can do a great deal of damage to your horse’s hooves, legs and general health by performing amateur farrier work. 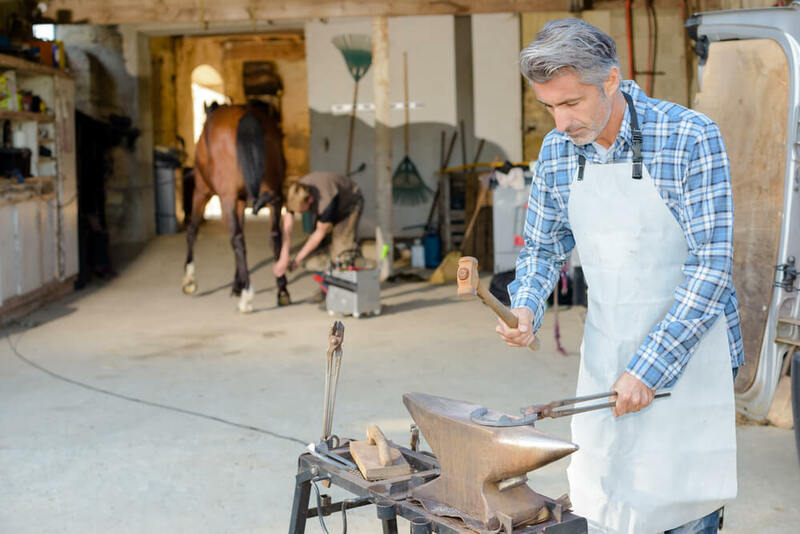 In this article, we discuss the role of a professional farrier and provide valuable information to help you successfully support and enhance your farrier’s job. Read on to learn more. 1 What Does It Take To Become A Farrier? 3 What Does A Good Hoof Trim Look Like? 4 What Tools Do You Need? 6 What Are Some Good Ways to Manage Your Horses’ Hooves? What Does It Take To Become A Farrier? A good farrier should have completed an accredited program that covers information as diverse as horse anatomy, horse psychology, hoof injuries and disease, diet and nutrition and actual trimming, shaping and shoeing of horses’ hooves. A good farrier keeps up with all the latest in his or her field by attending continuing education classes and participating in seminars, as well as keeping up on the most recent literature. A good farrier should be able to show you his certification as well as references from satisfied customers. He or she should also be able to show you proof of membership and certification in a national organization such as the Brotherhood of Working Farriers or the American Farrier’s Association. Both of these organizations require that their members pass tests to gain certification. If you intend to do any measure of farrier work yourself, you too should complete a hands-on accredited course and keep up with the most recent information. Gaining hands-on experience by volunteering as an apprentice or helper to a farrier could also help you become more skilled and more capable at managing your own horses’ hooves. Farrier training courses vary in length and intensity. Some last a few weeks and cover only the hands-on job of doing farrier work. Others may last months or even a couple of years and cover the business of being an actual farrier. 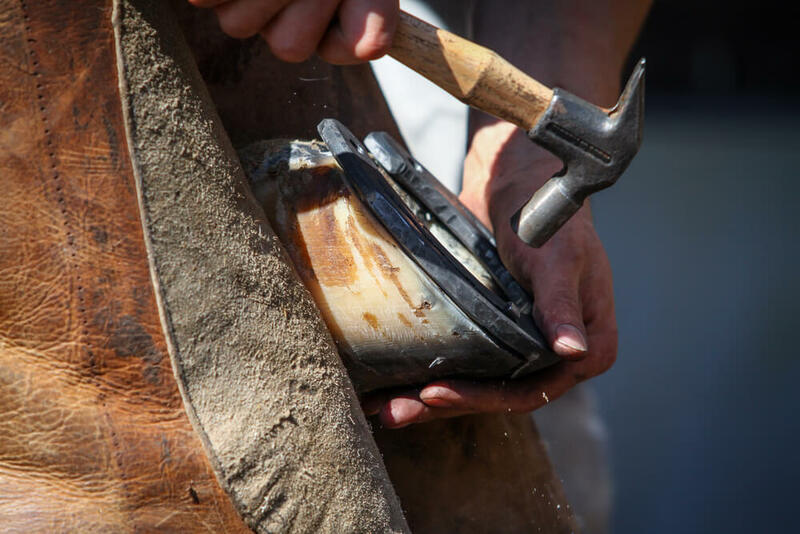 Obviously if you only want to work on your own horses and don’t want to be a farrier for pay, you could take a short course that just covers the hands-on aspects of the job. Regardless of which type of course you choose, be sure to go with an accredited farrier school. In this way, you can be certain of getting the best and most reliable training and recommendations for acquiring future knowledge. Foremost, you need to know how to handle a horse in a way that calms him and does not cause him distress. To do good farrier work, you need to be strong and fit and able to handle a horse with a great degree of quiet confidence. If you have any fear of your horse, you have no business attempting to trim or rasp his hooves, but you should practice handling his hooves a great deal to build both your confidence and the confidence of your horse. Before you even consider making any alterations to your horse’s hooves, you’ll need to understand the effect of conformation, age, diet and nutrition, breed, terrain and much more on the quality of horses’ hooves. If you have other equines (e.g. donkeys and mules) you’ll need to understand the difference between the hooves of these very different types of equines. The hoof wall and outer hoof line are the part of the hoof that make up the exterior. 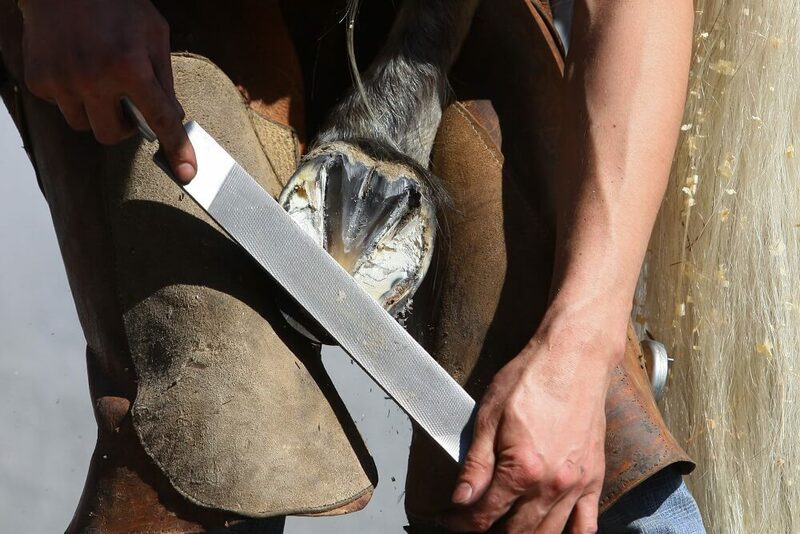 This hard part of the hoof is made up of keratin, much like our fingernails, it can be trimmed and filed without pain – as long as you don’t trim or file too deeply. The hoof sole is the entire underside of the foot. It is not extremely sensitive, but it can be hurt. Gouging the sole of the hoof can cause serious damage and lameness. The frog of the hoof is a fleshy, triangular portion towards the rear of the hoof. It starts at the heel and forms two distinct heel bulbs. It ends at a point in the center of the hoof. This area is rich in blood vessels and is somewhat sensitive. Great care must be taken in making any alterations to the frog. 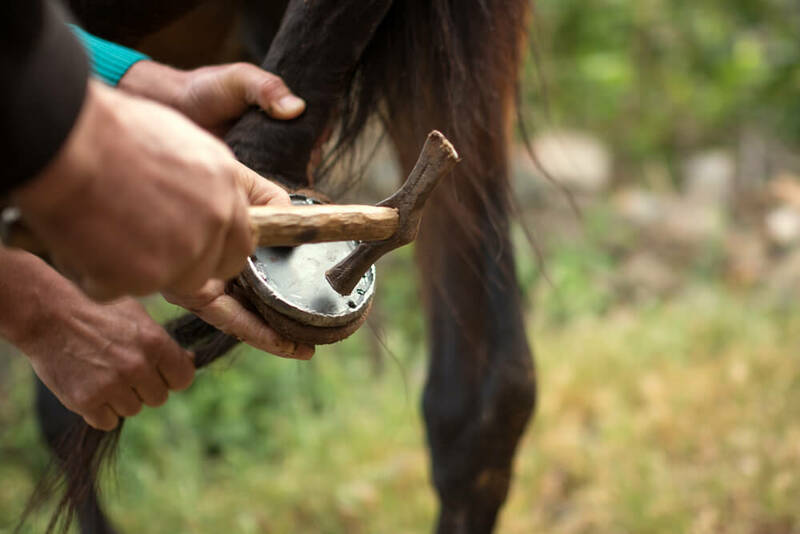 This is just a brief overview of these parts of the hoof, and this little bit of knowledge is not enough to equip you to trim your horses hooves or to presume to “be your own farrier”. It can, however, help you understand what a good trim looks like. This knowledge will help you to know when you might do a little maintenance work on your horse’s hooves between farrier visits. What Does A Good Hoof Trim Look Like? A good hoof trim gives the impression of a level and balanced hoof. The bottom of the hoof should be parallel with the coronet band (this is the upper band of the hoof where the hard material of the hoof ends and the fetlock begins). The heel bulbs of the frog should be the same height. The distance measured from the center of the frog to either wall of the hoof should be equal. The hoof angle should be equal with the angle of your horse’s pasterns, which should be equal with the angle of your horse’s shoulder. Naturally, some horses have slightly asymmetrical hooves and/or imperfections in conformation that make this ideal impossible. A skilled, trained and experienced farrier will know how to compensate for these imperfections. To learn how your horse’s hooves should look, you should examine them carefully after your horse has had a visit from a qualified farrier. Clean your horse’s hooves daily to keep a close eye on their condition. In this way, you will know what normal looks like and when something has gone amiss. A pair of flexible, well fitted leather gloves to keep your fingers and hands safe as you work. A pair of sharp hoof nippers for trimming off damaged areas of the hoof. A good hoof rasp for smoothing rough areas. A hoof pick to clean the horse’s hooves and remove any object that might become stuck in the hoof (e.g. a pebble stuck in the crease of the frog). A rounding hammer for shaping the horse shoe and a driving hammer for hammering in the nails that hold the shoe on. If you want to protect your thighs and legs while you work, you may want to invest in a pair of farrier chaps or apron. At the very least, be sure to wear a pair of sturdy jeans when working with your horse’s hooves. Bare skin is too easily scraped, scratched and bruised. An amateur farrier should never attempt to apply traditional metal horseshoes. This is a sensitive operation, and the amount of damage you can do in the process of applying a metal shoe can take months or years to grow out. 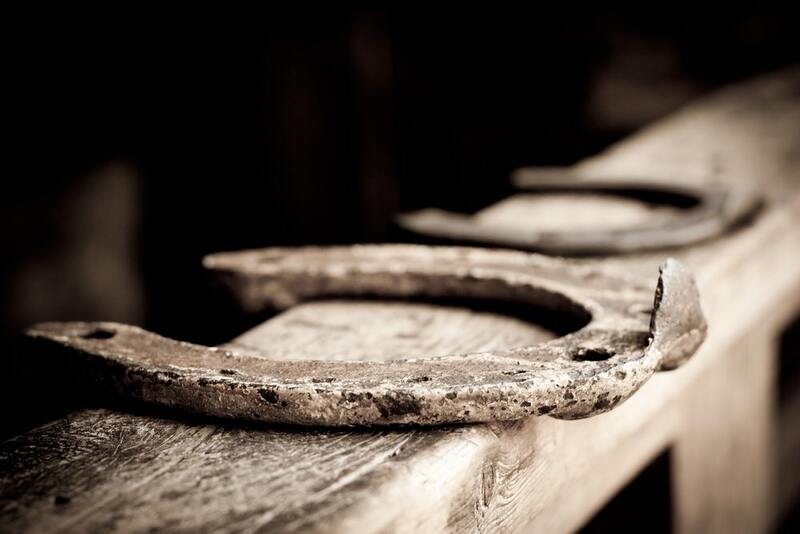 It is possible to permanently damage a horse’s hoof by applying shoes incorrectly. Additionally, just as with people, wearing poorly fitted shoes can cause pain and anatomical injury. These days, many farriers, veterinarians and horse men and women are opting for glue-on synthetic shoes and/or hoof boots. The fact is, both of these options are far less invasive than traditional metal shoes and hold less potential for causing damage. Additionally, these types of shoes provide many new possibilities for correcting hoof imperfections and problems. Even so, if you wish to try nonmetal shoes for your horse, you should consult with your farrier and/or your veterinarian to choose the right product to suit your needs and purposes. Furthermore, many horse men and women are choosing to go with a barefoot trim and simply leave their horses un-shod. A barefoot trim is a very specific type of trim that must be done correctly to be effective. It’s a good and affordable option if your horse has strong, healthy hooves. When you ride a barefoot horse, you can always add properly fitted hoof boots for occasions when you will be riding on hard surfaces or rough terrain. What Are Some Good Ways to Manage Your Horses’ Hooves? 1. Handle your horse’s hooves regularly. Every day you should pick up all of your horse’s hooves, clean them and examine them for problems like pebbles stuck in the creases, cuts, injuries, cracks, etc. If you develop this good habit, you will soon find that your horse voluntarily lifts his hoof for you and holds it up without problems. 2. Clear a space for your farrier. Before your farrier shows up for your appointment, move obstacles out of the way to give you, the farrier and your horse plenty of room. Tripping hazards can make a farrier visit very dangerous. 3. Put your dogs up. Don’t allow your dogs, cats or any other animal to wander around while your horse is having a trim. Dogs are especially problematic because they often like to pick up trimmed bits of hoof. They may get right up under your horse during the trim, and this can cause panic and lots of trouble. 4. If you have more than one horse, sweep the area clear between trimmings. This makes a clean workspace and removes temptation for any dog who might manage to make its way into the work area. 5. Present your horse with clean hooves. 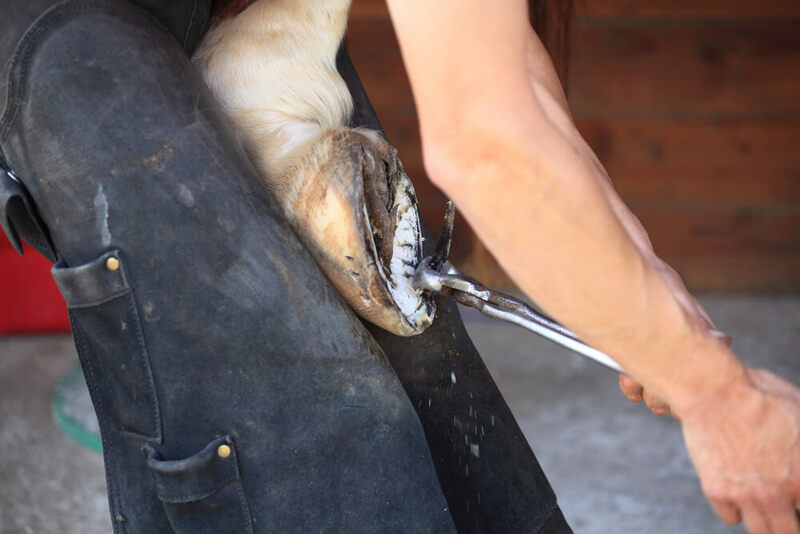 Before your farrier arrives go through your regular hoof cleaning routine. Don’t wash or soak your horse’s feet or apply hoof dressings as this will only complicate the process. Your farrier will be able to do his or her best work with a clean, dry hoof. 6. Hold your horse. Don’t have your horse tied during a farrier visit. Hold him and quiet and comfort him while the farrier is working. Be sure to prevent your horse from nuzzling or touching the farrier’s back or resting his chin on the farrier’s back. Especially, prevent him from biting the farrier! If your horse does act up, take a little break. Don’t try to discipline him while the farrier is working. 7. Keep up with maintenance between farrier visits. Every day when you examine your horse’s hooves check for minor damage that you might be able to correct yourself. You can use your hoof nippers carefully trim away any broken or damaged places on the hard wall of the hoof. Use the hoof rasp to smooth those areas down. This video gives a good demonstration of some simple “farrier work” you can perform at home. 8. Be sure to feed your horse a hoof-healthy diet. Horses need the right balance of protein, vitamins and minerals to grow strong healthy hooves. Without this, no amount of professional or amateur farrier work will do any good. 9. Maintain a healthy environment. Horses’ hooves are in constant contact with the ground, and they can be severely damaged by rough terrain, too much mud, unclean stall floors, debris and sharp objects and so on. Be sure to keep your stalls, paddocks and pastures clean and dry. 10. Coordinate with your vet and your farrier. Be sure that the left hand knows what the right hand is doing. Whenever you get recommendations from your farrier discuss them with your vet and vice versa. The ideal situation is to have a vet and a farrier who have a history of working together successfully.